Pets are great, right? They’re there to provide companionship, guard your house, and to give you the sad eyes until you hand over some food off your plate. In addition to keeping your place burglar and insect free, a pet can also be a great icebreaker when chatting up women. Being willing to talk about your little furry friends gives you an air of friendliness and sensitivity that will charm any lady, and being willing to listen to her talk about her own pets will definitely win you some points. Fair warning before you read on, if you don’t already have a pet, don’t buy one just because you think it’ll make women want to hop in bed with you. That’s unfair to whatever poor animal you choose, and irresponsible as hell. Fido didn’t sign up to be your wingman, after all. Of course, the first step is finding a woman who’s interested. It’s considerably easier to pick out women with pet interests on dating and hookup sites, since it’s probably all laid out on her profile. But offline, you’ll find plenty of places to scout out interesting ladies. Like dogs? 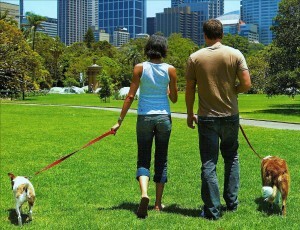 Try heading over to your local dog park with your dog in tow. Be careful when approaching women here, since it can be a real mood-breaker if your or her dog decides that they’re more interested in trying to rip out each other’s throat. Just ask if it’s alright for you to introduce your dog to hers, and then strike up a conversation from there. Even if you don’t have a dog, you might consider borrowing the dog of a friend or family member to take a walk here. It’s not dishonest if you just say that you’re dog-sitting as a favor, and you can get her talking about how you’d love to have a canine of your own someday. If you’re more of a cat person, it can be more difficult to find ladies with the same interests offline. Until someone opens up a cat park, you might try window-shopping in the cat supply section of local pet stores. In general, it tends to be easier to pick out cat people on dating sites or on online forums. The Internet does love its cats. If you’re interested in more exotic pets like snakes, lizards, birds, and so on, it’s a similar deal as with cats. You can luck out at specialty pet stores, but you’re probably better off looking online. You’ve found her, now what? Just do what comes naturally, and chat about your shared interest in animals. Talk about how you first got your pet, how you love to take them on jogs, that funny story about how they once wrecked your bathroom while you were out. You want to come across as someone who really loves their animal, not someone who’s just using them as walking, barking bait for potential dates. Especially if you’re talking to a lady who’s interested in exotics, you really want to know your stuff about habitats, feeding, and so on. If you try to bluff your way through conversations, you’ll come across as clueless at best, and careless about your animal’s health at worst.